Football season is officially underway and we couldn't be more excited! We will always be summer girls, but in the South fall is full of so many fun things. Leading the list is football and cheering on our favorite teams (Go Dawgs! Go Falcons!). Fall football also means fall Game Day attire. Getting dressed up (or dress down) for Game Day is almost as much fun as the game itself. You know we love us a good theme wear situation and down south game day provides the ultimate of theme wear opportunities. So today is all about our favorite team spirit gear, and some of the most trendy, comfy, and fun game day attire that we could find! What's a Game Day without the perfect comfy tee? We love showing off our team spirit, but we love be comfortable while doing so. Game days tend to be long and you are on your feet a large part of the day. These vintage style tees from Stewart Simmons are some of our favorite! 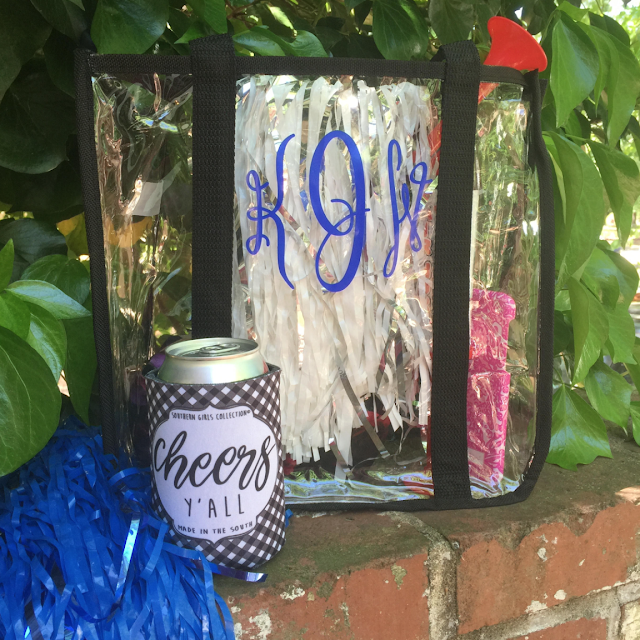 Stewart Simmons has a ton of super cute items for football season and beyond. They are one of our newest favorite small shops and we love love love they are based in Atlanta! The tees are super soft, and we love that the Bulldog logo is simple and not over the top. 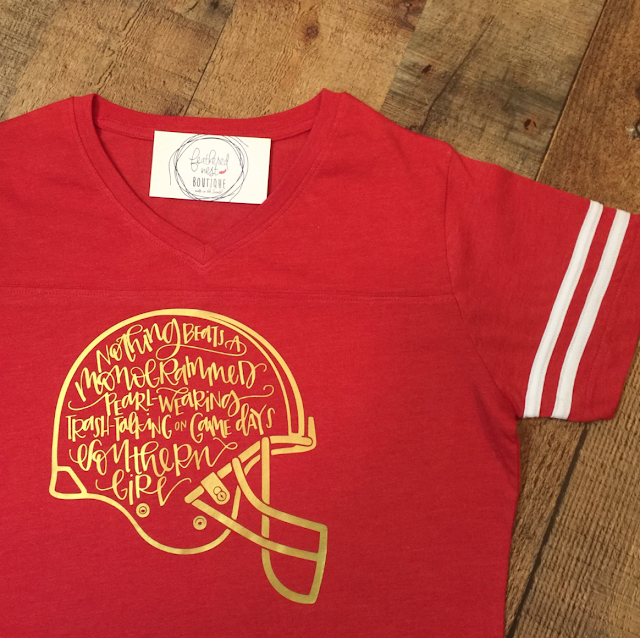 This Bulldog Pocket Tee has been Carrie Beth's Game Day go to since the season started. It's something we feel we can wear any day of the week! But don't worry. If you aren't a Dawg fan (but why aren't you? ), there are tons of cute tees available in other school mascots. Seriously, how cute are these tees? That is just a small peek at the adorable tees Stewart Simmons has. We probably will pick up a couple more before the season is over just because of how much we love them. We've also spotted some super cute tees while we have been out and about. Especially if you attending a tailgate, game or party, but aren't necessarily cheering on one particular team. The "Tailgates & Touchdowns tee" had us swooning and is currently on a delivery truck headed to one of our houses. Love it! Football season wouldn't be complete without throwing in a good dress or two in the mix. 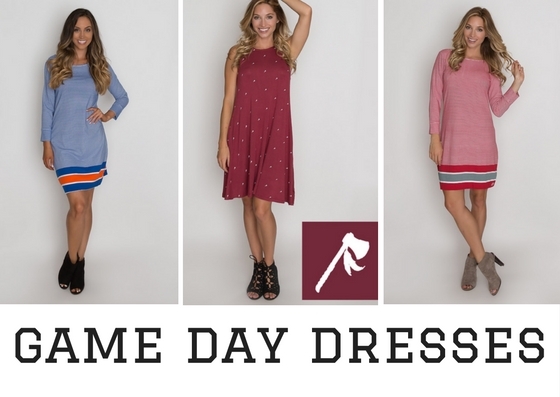 In the South it's typically tradition to wear dresses to the games, but as we've gotten older we've become a little more casual about our game day attire. That's why we love this cozy pocket shift dress. How cute is it, with the little bulldogs all over it?! It is super soft, and looks good on almost any body type. It looks great dressed up with booties or casual with flip flops. It's been one of our go-tos this season. It also comes in a red version that would be so cute with a black scarf or blazer once things cool off. Stewart Simmons also makes some other super adorable game day themed dresses. While we aren't huge Tennessee fans, this little shift is something we can get behind. We love the hound dog detailing at the bottom. Sometimes all you need to get in the spirit is a fun little accessory or two. Throw on a plain white tee and some jeans, or a solid color shift dress, and then put on a team inspired accessory and your tailgate outfit is complete! Hats are by far one of our favorite accessories. Especially during the hotter part of the season. Our faces are protected. We don't really have to worry about humidity killing our perfectly styled hair. They are the perfect game day accessory. Our favorites this year are these vintage styled ball caps. Aside from hats, our second favorite accessory is a good themed purse. We like them to be light, easy, and functional. Just large enough to hold our phones, tickets, and any other game day needs. Years ago Dooney and Bourke came out with their team spirit lines and we absolutely adore them! They have both NCAA teams and Pro teams available in a variety of styles and patterns. They are beyond cute in person. The crossbodies and wristlets are our favorite because they allows us to be hands free for the day. The totes are our go to when we have the kids with us, and we need something a little larger for their needs too. We know some stadiums have a no bag or a clear bag policy and that puts a limitation on what you can bring. We were so excited when we learned our girl Kathyrn came through with a super cute clear tote option. And it has a monogram! 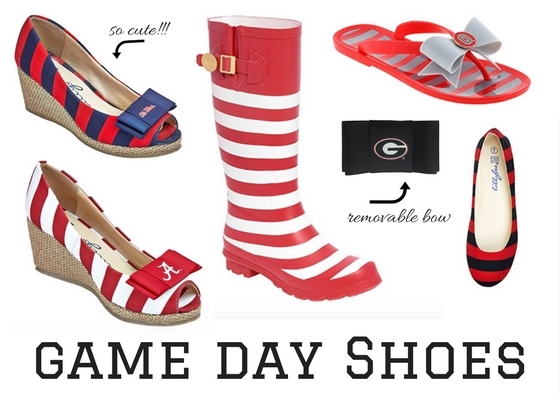 These game day shoes might be the cutest thing our eyes have ever seen! I mean how stinking cute are those wedges?! This little show line was something we stumbled upon while searching Amazon and died of the cuteness. The rainboots, flip flops, flats, and wedges are all so much fun. They come in a variety of team options and all have a removable bow. Love that! Especially with how cute these are to wear daily and not just on game days. Who will you be cheering on this weekend? There's just nothing better then football Sundays! !